As many of you already know, the weather here in Calgary has been pretty nasty. 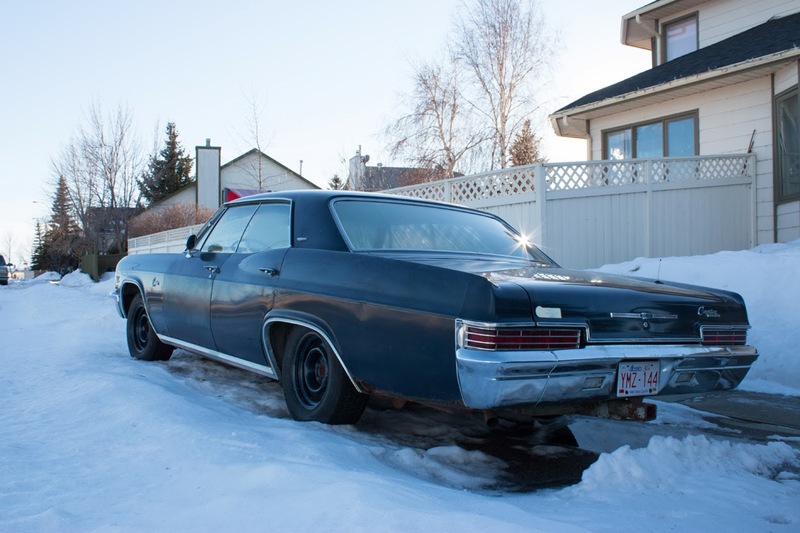 This winter's arctic temperatures and record snowfall has kept most classics off the street. But not this one. 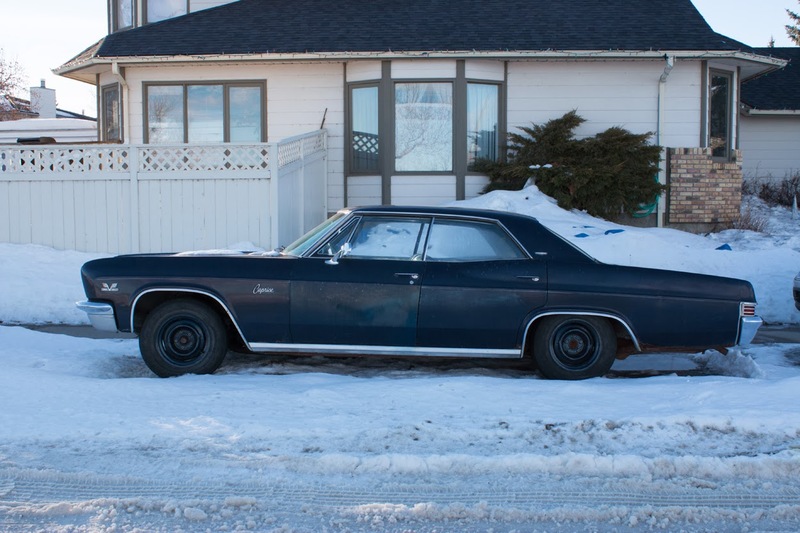 Shining brightly among the hoards of dirty SUV's, this 1966 Chevrolet Caprice is a sight for sore eyes. (And frozen eyelids) And this one's got a big block. 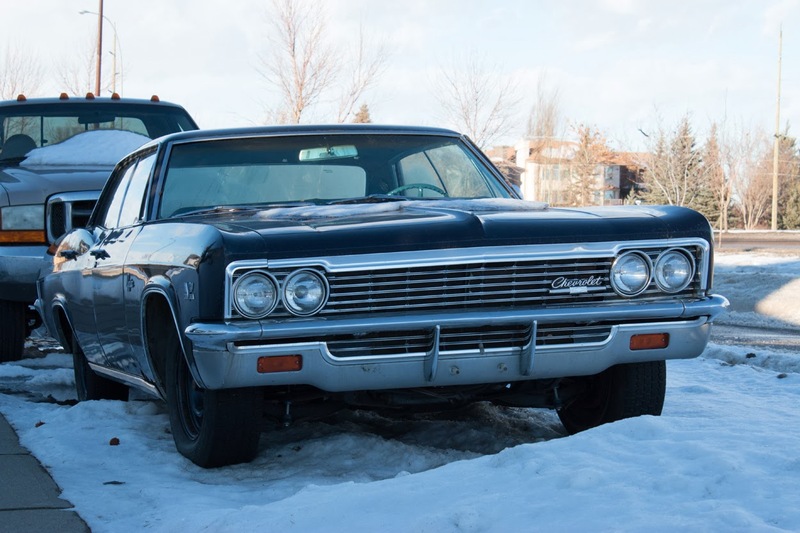 Sam and Dean Winchester from the Supernatural TV show drive a 1967 four door hardtop (No B pillar) full size Chevy. This one's a 1966 and has a very small chance of Hollywood stardom. 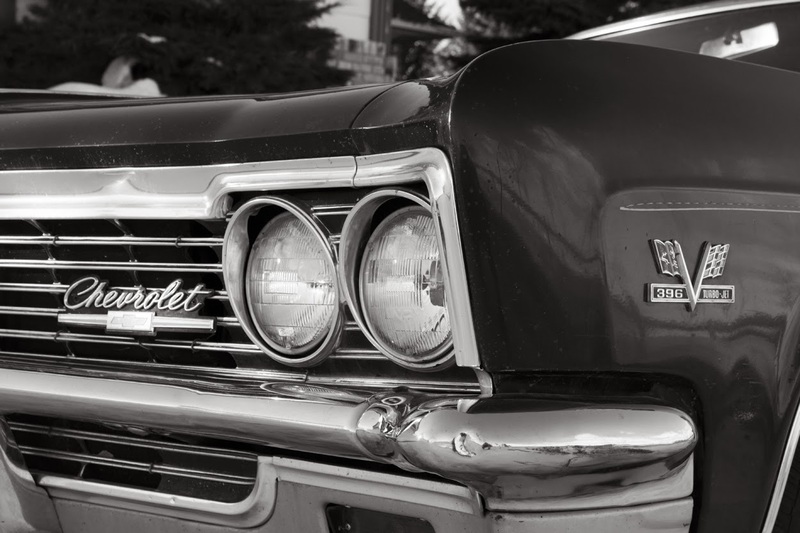 I'm no stranger to 1966 Chevy full sizes as I owned a very special one a while ago. Loved that car. The Caprice was essentially a ritzier version of the Impala. Though they shared a common frame, body and drivetrain, Caprices had nicer interiors and most came with larger engines. This one is moved along by a big bad 396 cubic inch V8. No smog equipment here, just 325 horsepower of lazy big block. It also produced an earthmoving 410 lb/ft of torque. Weighing in at around 3,500 pounds, it isn't a rocket ship but that 396 can move it with authority. 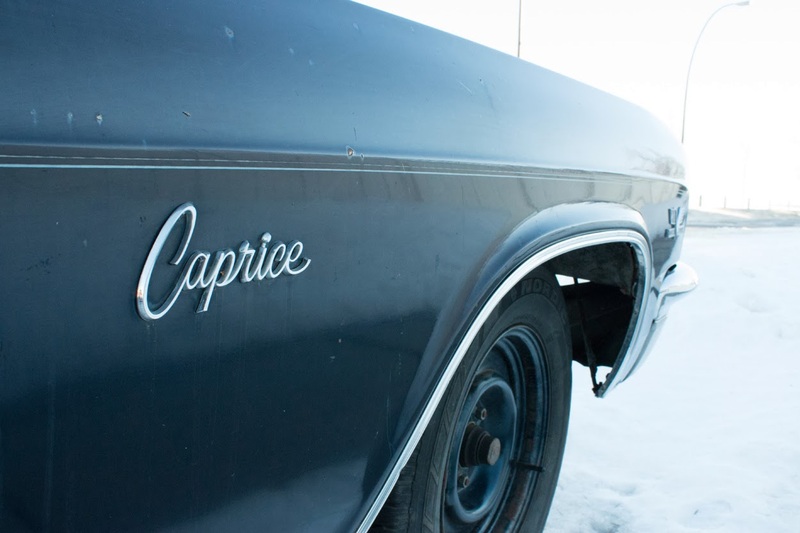 The Caprice was the most expensive Chevy sedan you could buy in 1966. If this wasn't enough luxury for you then you'd have to buy a Buick or an Oldsmobile. 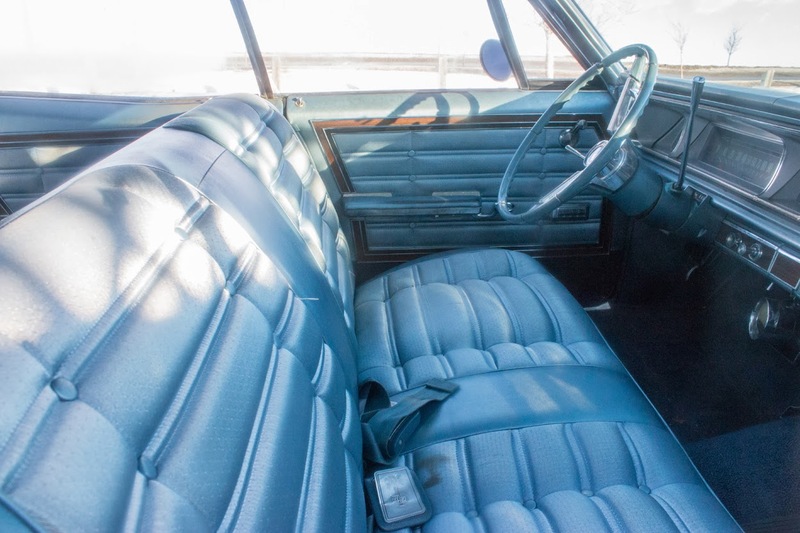 This baby blue bench seat looks a lot fancier than the one I had in my low-spec 1966 Impala. It just looks comfortable like no modern bucket seat can. Put your left hand on the wheel and your right hand around your girlfriend and cruise. These were the kind of seats that made fathers of daughters worry. This one's no cream puff but it's in decent shape for a vehicle of this age kept outdoors. Check out those swiss cheese "superleggera" rear quarter panels. It's hard to tell if the odd stance is caused by the uneven snow it's parked on or collapsed rear suspension. These cars were made when GM was at its absolute peak. America was a land of industrial might and confidence. These cars reflect that with their hewn-from-stone build quality and unapologetically sharp design. There are no cars like the Caprice made today so you'd be wise to pick one up. I highly recommend it if you have the means.